Pam Nash was probably one of the most photographed members of the Bristol Tattoo Club. Many news articles and photographs of her showed up in the English press. Following are excerpts from a 1959 news article about her and the Bristol club. "It was "ladies night" on Saturday for the members of Bristol Tattoo Club when they held their sixth annual party in the Cornish Mount, Pennywell Road. For the cause of the celebration was the presentation of a cup for "the best tattooed girl of the year" to Miss Pamela Nash, of 8 Hereford Place, Cheltenham. 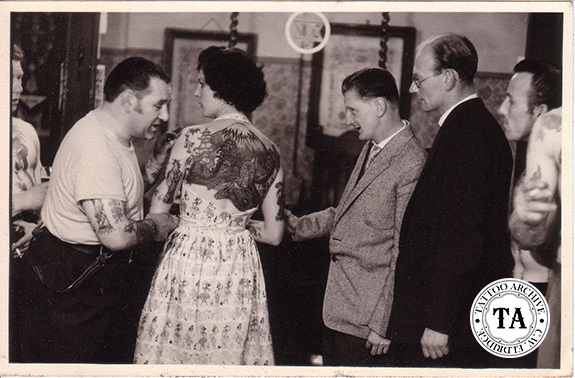 Making the presentation was Mr. Skuse, president who has been champion tattoo artist of England since 1955”. Wearing a backless dress, Miss Nash displayed the masterpiece, which won her the accolade. Portraying a Chinese garden, it includes a snow-capped volcano reaching up to her neckline, pagodas and dragons stretching almost to her ribs, and undergrowth extending down into the small of the back. "We've been at work on the design since Easter," explained Miss Nash, who has a dozen different tattoos on her arms as well. "I have a bit more added each week." At the present this is the only tattoo club in the country, but the guests on Saturday included Mr. Jimmy Thomson and Mr. Joe Leigh, both tattoo artists from Manchester, who are hoping to start a similar club there. "Our club has attracted a lot of interest," said Mr. Les Skuse, "and at present our membership stands at 106. But we don't just let anyone in. They must have either a full chest or full back design, or at least £5 worth of work on their arms. Just for recognition purposes every member carries hidden somewhere among his tattoos the club insignia of a black bat."